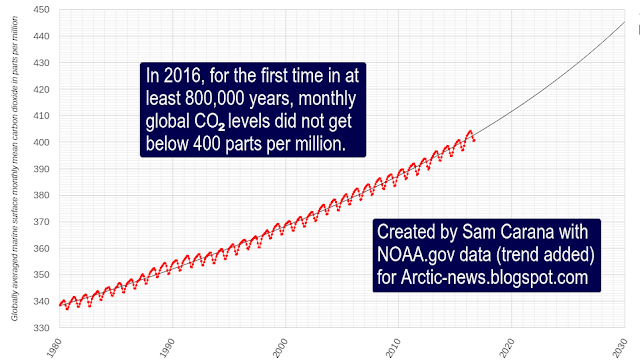 Nonetheless, CO₂ levels have continued to rise and, as illustrated by the trend on the image below, they may even be accelerating. 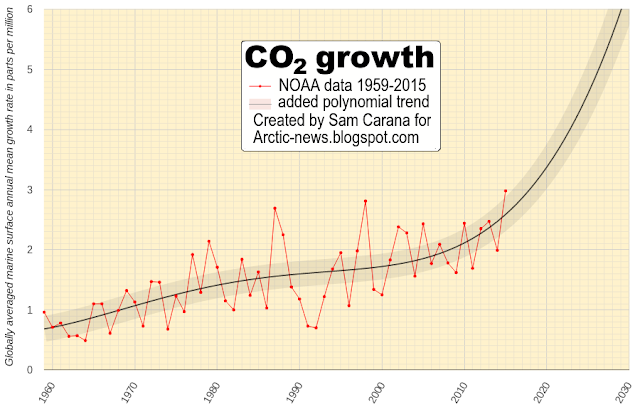 According to NOAA, annual mean global carbon dioxide grew from 2004-2014 by an average 2.02 ppm per year. For 2015 the growth rate was 2.98 ppm. As an indication for what the 2016 growth rate will be, global CO₂ levels grew by 3.57 ppm between September 2015 and September 2016, and by 3.71 ppm between October 2015 and October 2016. How could growth in CO₂ levels in the atmosphere possibly be accelerating, given that emissions from fossil fuel burning and cement production have barely risen over the past few years? During the decade from 2006 to 2015, emissions from deforestation and other land-use change added another 1.0±0.5 GtC (3.3±1.8 GtCO₂) on average, on top of the above emissions from fossil fuel and cement. In 2015, according to the Global Carbon Project, deforestation and other changes in land use added another 1.3 GtC (or 4.8 billion tonnes of CO₂), on top of the 36.3 billion tonnes of CO₂ emitted from fossil fuels and industry. This rise in emissions from deforestation and other changes in land use constitutes a significant increase (by 42%) over the average emissions of the previous decade, and this jump was largely caused by an increase in wildfires over the past few years. In 2016, monthly mean global CO₂ levels didn't get below 400 ppm. It was the first time that this happened in over 800,000 years. On their way up, global CO₂ levels fluctuate with the seasons, typically reaching an annual minimum in August. In August 2016, CO₂ levels reached a low of 400.44 ppm, i.e. well above 400 ppm. In September 2016, carbon dioxide levels had gone up again, to 400.72 ppm. 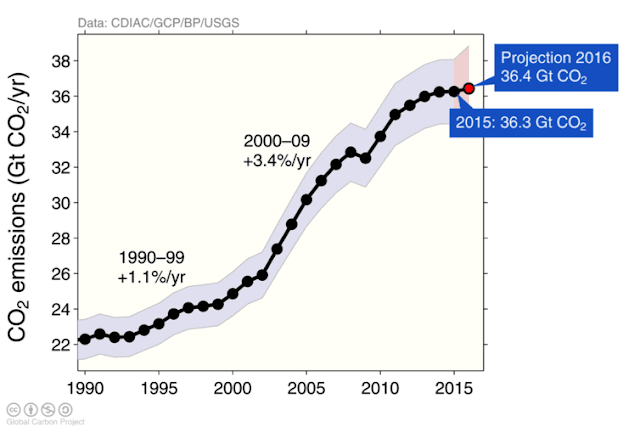 Importantly, a trend is contained in the data indicating that growth is accelerating and pointing at a CO₂ level of 445 ppm by the year 2030. Meanwhile, research including a 2014 study by Franks et al. concludes that IPCC was too low in its estimates for the upcoming temperature rise locked in for current CO₂ levels. A study by Friedrich et al. updates IPCC estimates for sensitivity to CO₂ rise, concluding that temperatures could rise by as much as 7.36°C by 2100 as a result of rising CO₂ levels. 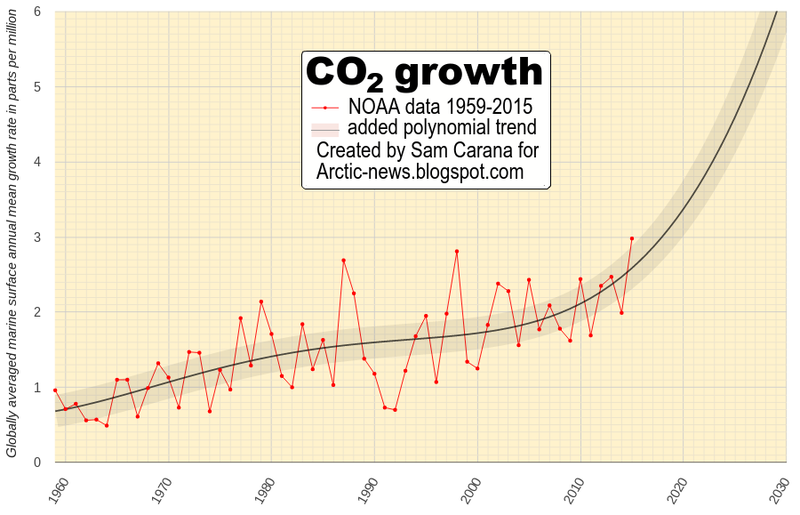 When also taking other elements than CO₂ more fully into account, the situation looks to be even worse than this, i.e. the global temperature rise could be more than 10°C (or 18°F) over the coming decade, as further described at the extinction page. 1 Gigatonne (Gt) = 1 billion tonnes = 1 Petagram (Pg). 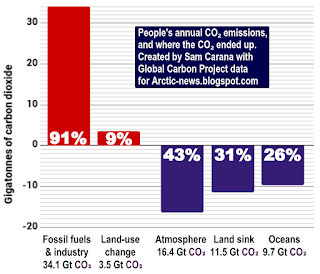 40% of CO₂ emissions since the start of the industrial era. (annual global average over 2006 - 2015). Above image also shows an increase of the land sink over the years, which a recent study attributes to higher CO₂ levels in the atmosphere. While this increase of the land sink appears to have held back a stronger temperature rise for some time, there are indications that this land sink is now decreasing. A recent study suggests that some 30 ± 30PgC could be lost from the top 10 cm surface soil for a 1°C, and some 55 ± 50 PgC for a 2°C rise of global average soil surface temperatures, which would increase CO₂ levels in the atmosphere by some 25 ppm. The study adds that, since high-latitude regions have the largest standing soil C stocks and the fastest expected rates of warming, the overwhelming majority of warming-induced soil C losses are likely to occur in Arctic and subarctic regions. See also the video below for more on this study. Deforestation and Soil Degradation: Agricultural practices such as depleting groundwater and aquifers, plowing, mono-cultures and cutting and burning of trees to raise livestock can significantly reduce the carbon content of soils, along with soil moisture and nutrients levels. Climate change and extreme weather events: The recent jump in global temperature appears to have severely damaged soils and vegetation. Soil carbon loss and enhanced decomposition of vegetation appear to have occurred both because of the temperature rise and the resulting extreme weather events such as heatwaves, drought, dust-storms and wildfires, and storms, hail, lightning, flooding and the associated erosion, turning parts of what was once a huge land sink into sources of CO₂ emissions. Even worse, such extreme weather events can also lead to emissions other than CO₂ emissions, such as of soot, nitrous oxide, methane and carbon monoxide, which can in turn cause a rise in the levels of ground-level ozone, thus further weakening vegetation and making plants even more vulnerable to pests and infestations. Albedo: As a 2009 study warned, higher temperatures could also cause decreased canopy transpiration, due to less widely opened plant stomata and the resultant increase in stomatal resistance at higher atmospheric CO₂ concentrations. As a result, low cloud cover is decreasing over most of the land surface, reducing planetary albedo and causing more solar radiation to reach the surface, thus further raising temperatures beyond the level of viability for many species. At the same time, the above extreme weather events are causing more water vapor to rise high in the atmosphere, resulting in cirrus clouds that reflect only little sunlight back into space, while trapping more heat (i.e. surface radiation emitted as longwave energy into space). Furthermore, emissions such as dust and soot from wildfires and storms can settle on snow and ice, resulting in faster melting. Explanation of Quantifying global soil carbon losses in response to warming (1 December 2016) by lead author Thomas Crowther from the Netherlands Institute of Ecology (NIOO-KNAW) and Yale University. In conclusion, while CO₂ emissions from fossil fuels and industry may have barely grown, levels of greenhouse gases are steadily increasing, if not accelerating. At the same time, extreme weather events are on the rise and there are further factors contributing to cause the land carbon sink to shrink in size. Furthermore, the IPCC appears to have underestimated sensitivity to CO₂ rise. 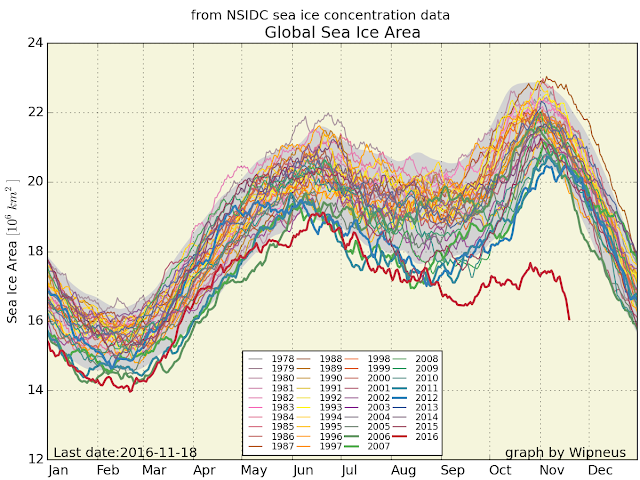 Without action, temperatures can therefore be expected to rise further, rather than come down from their currently already very high levels, as illustrated by the image below. The image below shows the temperature rise of the oceans. 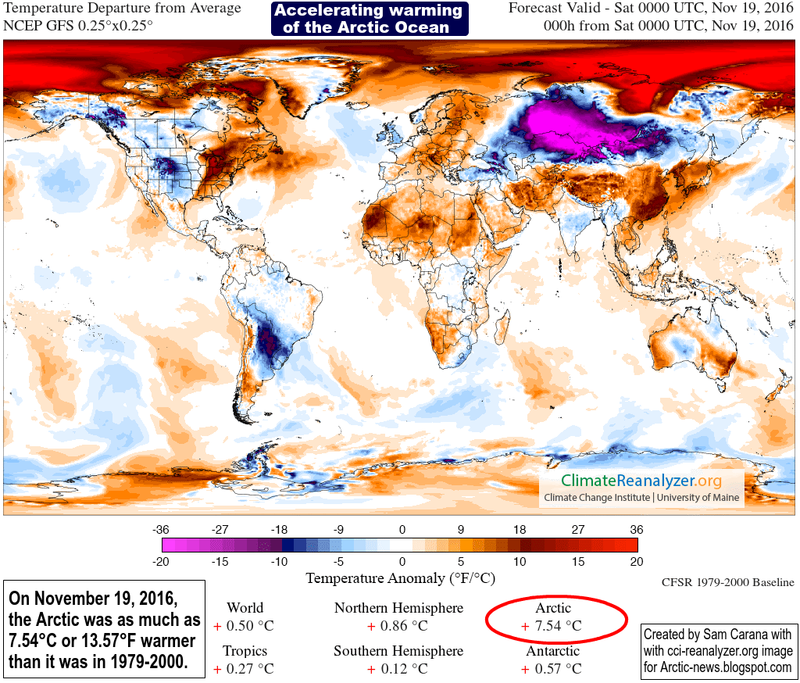 Temperatures are rising particularly rapidly on the Northern Hemisphere. Much of that heat is carried by the Coriolis force along the Gulf Stream toward the Arctic Ocean. This contributes to a huge rise in the temperature of the atmosphere over the Arctic Ocean, as illustrated by the images below. 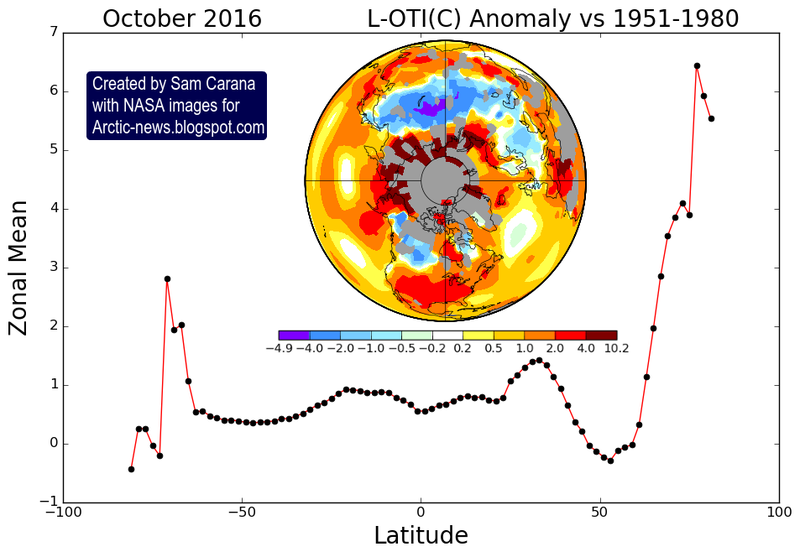 The image directly below shows showing temperature rises up to 10.2°C in the Arctic for October 2016. The DMI graph below shows daily mean temperature and climate north of the 80th northern parallel, as a function of the day of year. 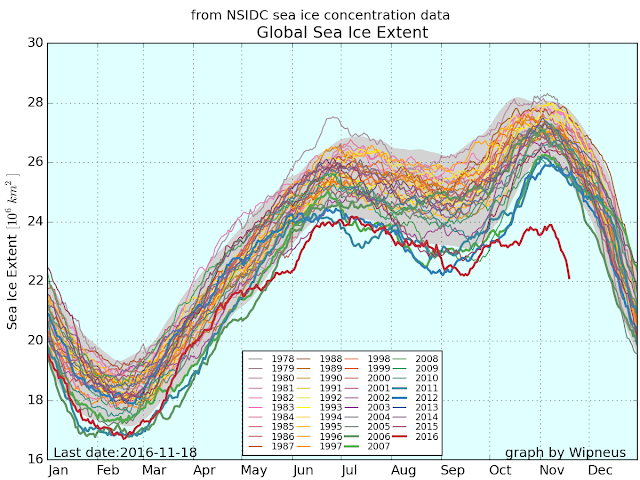 Red line: 2016 up to November 15, 2016. - Green line: climate 1958-2002. On November 19, 2016, on 00.00 UTC, the Arctic was as much as 7.54°C or 13.57°F warmer than it was in 1979-2000, as illustrated by the image below. The image below shows the average temperature on November 19, 2016. 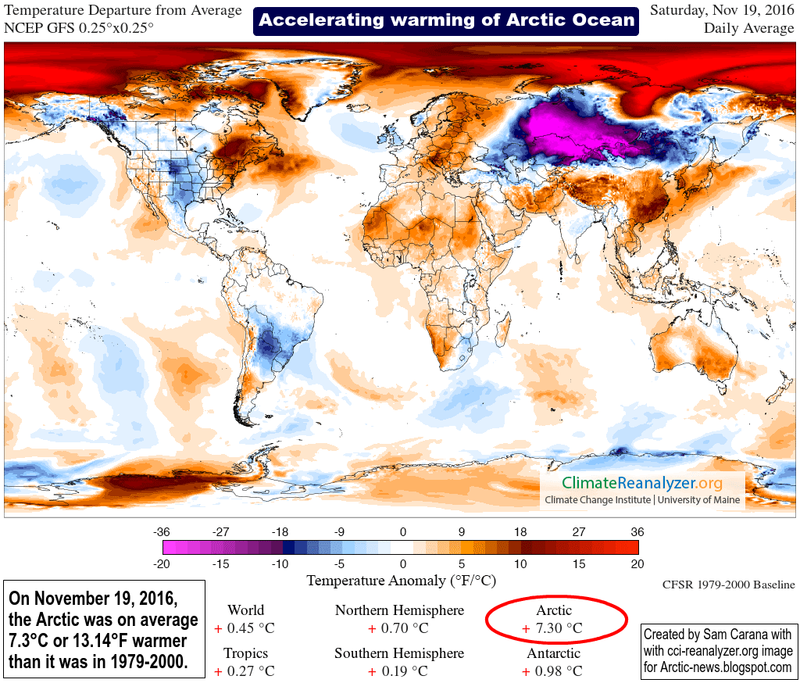 The Arctic was 7.3°C or 13.14°F warmer than it was in 1979-2000, illustrating the accelerating warming of the Arctic Ocean. 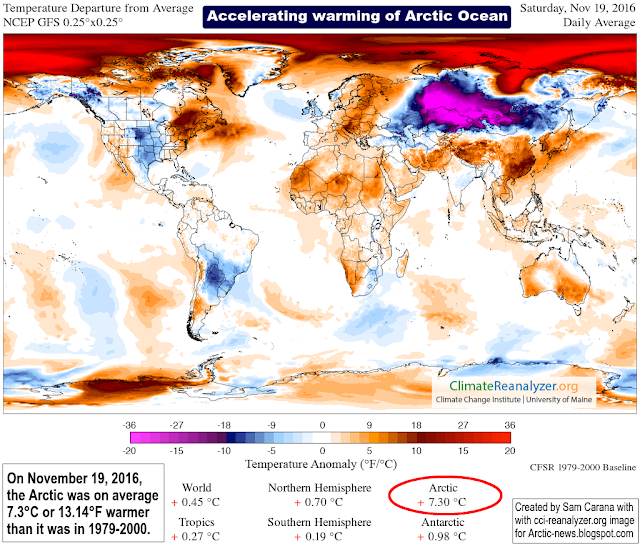 The Arctic Ocean in many places shows temperature anomalies at the top end of the scale, i.e. 20°C or 36°F. As another reflection of an increasingly warmer world, the combined extent of Arctic and Antarctic sea ice is currently at a record low. On November 12, 2016, combined global sea ice extent was only 23.508 million km². On November 18, 2016, combined Arctic and Antarctic sea ice extent was only 22.608 million km². That's a fall of 0.9 million km² in six days! Two images, created by Wipneus with NSIDC data, are added below to further illustrate the situation. Above image shows global sea ice extent over the years, while the image below shows global sea ice area over the years. For more on the difference between extent and area, see this NSIDC FAQ page. More Ocean Heat: Huge amounts of sunlight that were previously reflected back into space are now instead absorbed by oceans. Faster Melt: Decline of the sea ice makes it easier for warm sea water to get underneath glaciers and speed up their flow into the water. Stronger Storms: More open water results in stronger storms, causing rainfall and further decline of the snow and ice cover, as well as greater cloud cover at high altitudes, resulting in more warming. More Methane: Further decline of the snow and ice cover on Greenland and Antarctica in turn threatens to cause increased releases of methane from Greenland and Antarctica, as described in earlier posts such as this one. 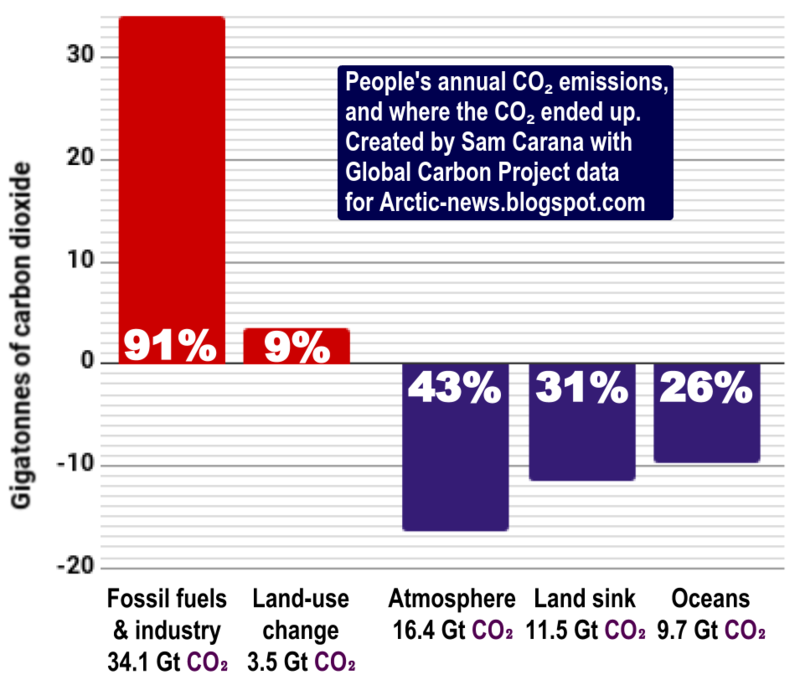 Furthermore, continued warming of the Arctic Ocean threatens to cause huge eruptions of methane from its seafloor. While carbon dioxide emissions get a lot of attention (and they definitely must be cut rapidly and dramatically), the rise of methane is possibly even more worrying. 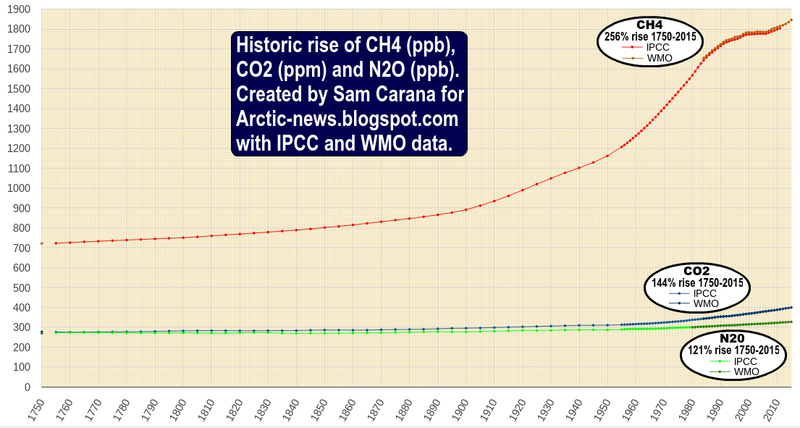 The image below shows historic growth rates of methane (CH4), carbon dioxide (CO₂) and nitrous oxide (N2O). According to NOAA data, annual mean global methane grew from 2004-2013 by an average of 3.75 ppb per year. In 2014, the growth rate was 12.56 ppb. In 2015, the growth rate was 10.14 ppb. According to the WMO, methane's 2014–2015 absolute increase was 11 ppb. For more on methane, see the methane page. Neither was weekly at Mauna Loa. 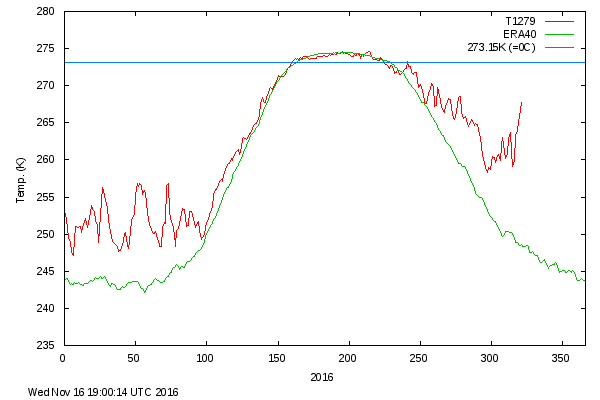 It's starting to look like people should be focused on harvesting the sun's rays for energy and shielding the arctic ocean. Without the ice, there's no shield to keep the ocean balanced. Weather will be unlike anything we've seen in recorded history soon. Carbon capture efforts directed at the CH4 escaping is imperative. We will die off without focusing our entire planet's resources on countering the effects of our lack for hindsight. All the while, trying harder to have an understanding over actions' consequences for the future.